Happy Wellness Wednesday and International Women’s Day! Are you feeling some stress and burnout from a busy week? For today’s self-care routine, I thought it would be fun to show you how to set up a relaxing home sanctuary, with some self-care rituals to help you slow down and reconnect. 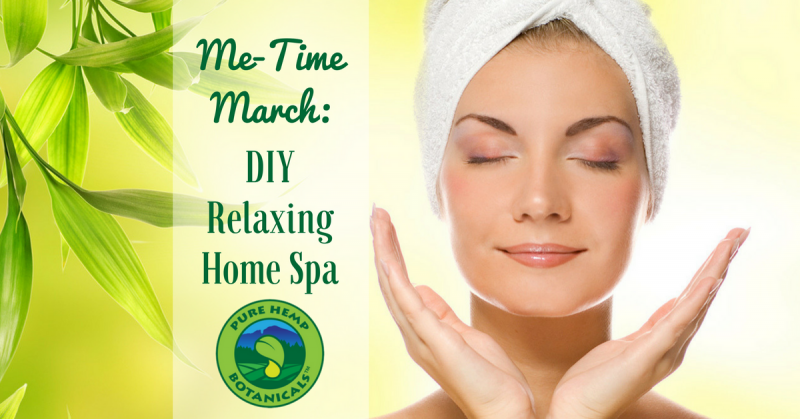 Since it’s International Women’s Day, I thought some home spa pampering time would be fun. We know that being a woman is hard work, and taking time for self-care and relaxation is key to feeling and doing your best in life. Here’s some natural DIY routines to bring some zen back into your day. First things first: comfy clothes are a MUST. If you are wearing something restrictive and uncomfortable, change it up! I’m a fan of loose, breathable t-shirts and pajama pants. Get your CBD game going: Whether you vape, eat or topically apply your CBD, make sure you get some in or on you, to help you relax through your experience. I personally like to start with a dropper of our Tincture under my tongue, because it’s so fast-absorbing. Sometimes I’ll vape too, and focus on my breath to get centered. If you’d like a nice refreshing inhalation there, try our Sweet Mint or Candy Cane vape flavors! Next: Set the scene. Watch this awesome video, and set up a peaceful little sanctuary for yourself. Take your time, put on your favorite relaxing music, and make this time all about you! Everyone deserves some time to simply enjoy themselves, and if you’re like many other women, it’s been a while since you’ve had a chance! Want to make the scrubs she uses? Here are the ingredients! You may even have most of these at home anyway. Most of all though, take this time to appreciate yourself! We each have our own journey, unique to ourselves. Take this time to notice ways you’ve stepped up, things you are proud of, and things that you look forward to. What can you celebrate about you today?